Dedicated to the promotion and celebration of the art of wedding photography from across the globe. We live in an exciting time with technology that is allowing photographers of all genre’s greater scope, flexibility and expression of concepts and emotions, and none more-so than Wedding Photography. The IWPOTY showcases the work of Wedding Photographers worldwide and will no doubt be the new benchmark for wedding photography competitions. The IWPOTY are open to everyone – Professional Photographers, Enthusiasts / amateur and Students. Early entries close December 24, and late entries close December 31. 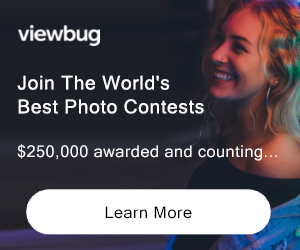 PRIZE DETAILS: US$25,000 in cash and prizes, including US$3000 cash, a Nikon D850, and Elinchrom lighting Not eligible to enter? - Find contest where you are.